Clean Well Water Report: What Type of Water Neutralizer Should I Use for My Well Water? What Type of Water Neutralizer Should I Use for My Well Water? I have a problem with copper corrosion at our home. We noticed the blue stains on the bathtub and toilet when we first bought this house. Since then we have had some small leaks in our pipes. We had the water tested: hardness = 10 mg/L, pH = 6.4, total dissolved solids = 130 mg/L. We don’t have any iron, or sediment, no odors. We have 2 bathrooms, my husband and I, plus two kids. We like the water, just want to get rid of the acidity. What do you suggest? Our neighbors have a water neutralizer from you, but we wanted to get your opinion directly. Thank you! One very effective method to treat acidic water is by implementing an Acid Water Neutralizer. 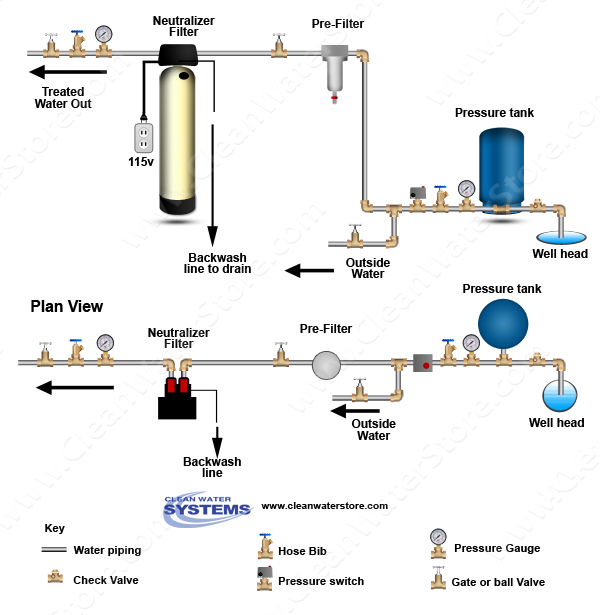 A water neutralizer system will raise the pH to a Neutral level, around 7 – 7.5, will stop and prevent pin-hole leaks from occurring, and also reduce copper residuals in the water as well. As the raw water in this case at 6.4, I would recommend a straight Calcite (Calcium Carbonate) system. Many customers with this type of water used to have blue-green stains from copper pipe corrosion and after installing a Neutralizer see their blue stains disappear within a few weeks. The Neutralizer filter comes with everything you need including necessary Calcite media along with simple installation instructions. Any plumber or person familiar with basic plumbing can install them. I would recommend an optional Spindown filter which would be installed upstream of the backwashing filter so as to protect against sand/sediment from entering the control valve and cause unwanted problems. You can also use this to shock the filter/house with Bleach or Peroxide from time to time as will help with odor buildup as well as improving the filters cleanliness and longevity. 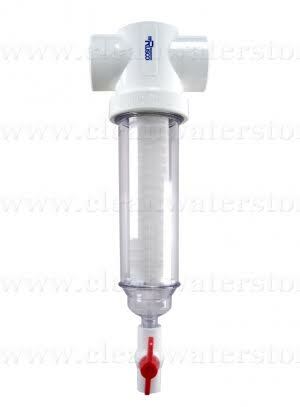 The Spindown filter uses a mesh screen thus no filter cartridges that need constant servicing. Simply flush the valve for 10 – 20 seconds about once a month or as needed and done. The following will provide images, product links, as well as a brief description on the components as recommended. Raises pH and prevents copper corrosion, uses a standard tank with gravel. 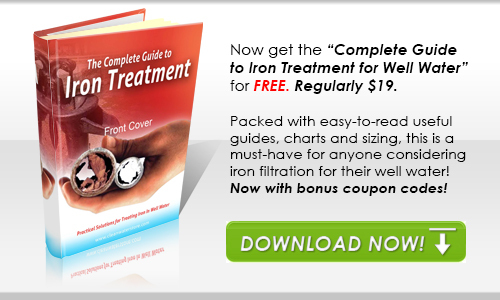 Includes Free pH test kit to ensure proper operation. Rugged heavy-duty digital backwash control valve features fully adjustable backwash and rinse cycles saving water and allowing maximized performance. Much longer life than cartridges or Upflow Neutralizers. Dimensions: 10" diameter x 61" height with valve attached. 1” pipe connectors and the bypass is included. Will ship in several boxes, all installation instructions will be emailed to you for review. We also offer professional tech support should you need it. Shipping Weight: 176 lbs. Will arrive in several boxes, including a funnel and Manual as well as all installation instructions. We’re also available for professional tech support should you need it. Excellent warranty: 10 years on the filter tank; Industry leading 7 years on the control valve. Rusco Spin-Down Filter 1" SxS Port (Slip x Slip, for PVC pipes or glued connections), 60 Mesh (254 Microns). Includes 1/2" manual flush ball valve. Spin-Down Sediment Filters are highly flexible filters designed to be utilized in a wide variety of applications. This would protect the Iron filter from sand, debris, etc. with no cartridges to change. Why Choose Clean Water Systems? Free Shipping: All quoted prices include shipping to Maryland at no charge. No Sales Tax as well. 90 Day Guarantee: Try the system out and return within 90 Days if not completely satisfied. Dedicated Support: Our trained and certified water specialists are here to help if you have any questions. Our support and service is #1 in our industry.